Protecting drinking water and preventing harmful coastal "dead zones", as well as eutrophication in many lakes, will require reducing both nitrogen and phosphorus pollution. Because streams and rivers are conduits to the sea, management strategies should be implemented along the land-to-ocean continuum. In most cases, strategies that focus only on one nutrient will fail. These policy recommendations were put forth by a team of distinguished scientists in the recent issue of Science, published today. Led by Dr. Daniel J. Conley, a marine ecologist at the GeoBiosphere Science Centre in Sweden and a Visiting Scientist at the Cary Institute of Ecosystem Studies, the paper reviews weaknesses in single-nutrient management strategies. In most cases, improving water quality and preserving coastal oceans will require a two-pronged approach. Plant growth is tied to nitrogen and phosphorus availability. Human activities have greatly increased the abundance of these nutrients, causing the overproduction of aquatic plants and algae. Nitrogen pollution is largely derived from agricultural fertilizers and emissions from the combustion of fossil fuels. Phosphorus pollution is tied primarily to wastewater treatment and detergents. Inputs to the landscape make their way to coastal areas through the drainage networks of rivers and streams. Dr. Gene E. Likens, one of the paper's authors and an ecologist at the Cary Institute of Ecosystem Studies, comments, "Historically, environmental management strategies in freshwater systems have focused on reducing phosphorus pollution. 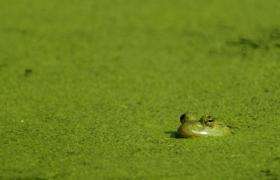 While this has minimized freshwater algal blooms, it passed a great deal of nitrogen pollution on to coastal ecosystems, driving eutrophication and causing serious and widespread problems in those regions." These environmental problems include reductions in the oxygen levels of coastal water, which can cause "dead zones" and fish die-offs; the proliferation of undesirable plant growth; reductions in water quality; and the loss of important coastal fish habitat, such as sea grass and kelp beds. Likens stresses, "By focusing only on minimizing phosphorus in our fresh waters, and ignoring nitrogen inputs, existing management strategies are exacerbating the decline of coastal ecosystems. We need to stop passing the problem downstream and adopt dual-nutrient reduction strategies." Eutrophication is a problem of global concern. Worldwide, there are over 415 eutrophic coastal ecosystems. As a result of human population growth and increased pollution, this number continues to rise. Fish eggs are suffocating in Lake Michigan reefs. What will it take to save these nurseries?